I’ve been obsessively watching the current Japanese Power Rangers show, Kaizoku Sentai Gokaiger. The hard part has been keeping my show related purchases to a minimum while I wait for the real action figures to arrive. That wait is finally coming to an end. Kaizoku Sentai Gokaiger is the 35th Super Sentai team, bringing the grand total up to 199 individual Power Rangers since 1975. It focuses on five space pirates and their adventures in fighting the evil Space Empire Zangyack, while simultaneously searching for “the greatest treasure in the universe”. What makes this team so unique is their ability to access the powers of the previous 34 Super Sentai teams with the help of Ranger Keys. Not only do the keys grant them the abilities of the previous Rangers, but it also changes their costumes into those respective team designs. Not only is the show distinctive by celebrating the previous history of the Super Sentai series, but the characters also have their own way of saving the day. I haven’t seen them all, but most Sentai teams have noble and courageous members who fight for the side of good and protect the innocent. The Gokaiger aren’t as up front about their motives. Sure they’re the good guys and still protect the people of Earth, but they have to maintain their tough pirate image. So instead of openly fighting Zangyack because their evil, they usually make excuses like Zangyack ruined their dinner, or Zangyack interrupted their shopping, or just the simple Zangyack is annoying them at the moment. The leader of the pirates is Captain Marvelous, the Red Ranger of the team and the first to be made in the S.H. 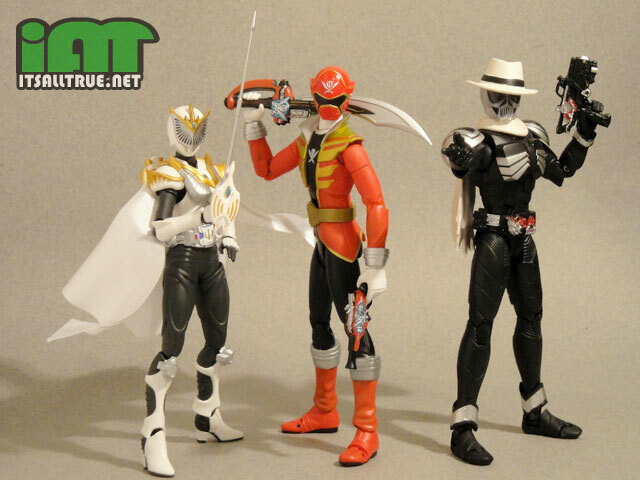 Figuarts line. This is the first Gokaiger “buck” body to be created, and will be reused on both the Gokai Blue and Green figures as well. 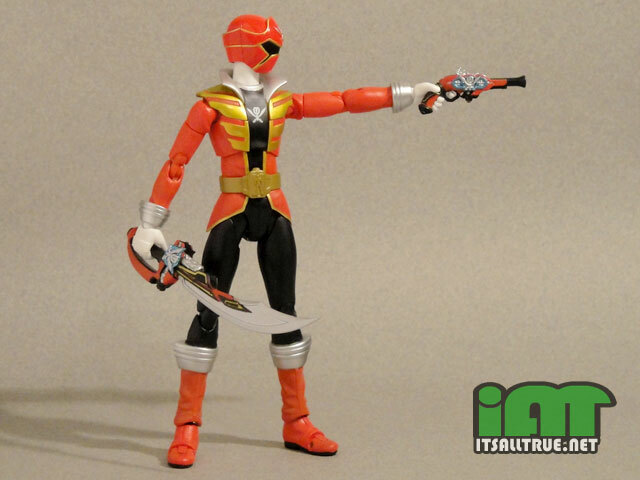 Some pieces will even end up on Gokai Silver’s figure as well. Like most Ranger uniforms, the design is dynamic yet simple. This is also reflected in the sculpt of the figure. Each detail and line on the figure is a raised piece, and there are also areas with sculpted folds in the fabric of his costume. Yet it’s all kept to a minimum so the figure comes off as uncluttered and almost plain at first glance. 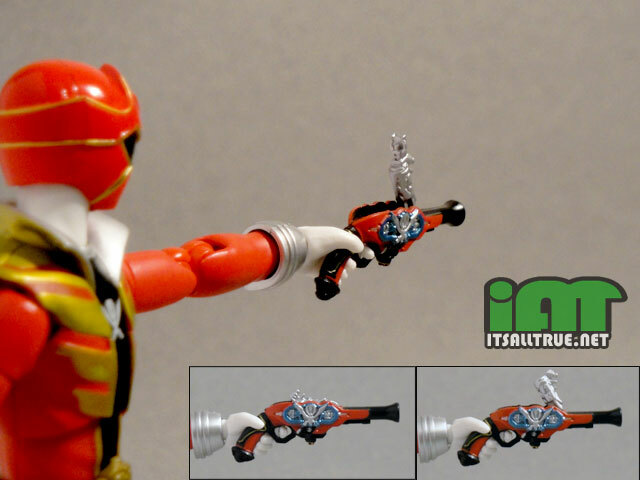 Gokai Red’s paint job is also simple. The figure is molded in red, black, and white, with most of the gold and silver touches being added on. This is the area where I’ve seen most of the complaints about this figure, and unfortunately mine also has a few problems here. You’ll notice in some of my pictures that the side of his left forearm has a black smudge on it. This is where the red paint had been touched before curing, causing it to smudge and allowing the molded black piece to show through. There is also a fingerprint on the black area of his chest. It’s definitely not as noticeable, the camera wasn’t even able to pick it up, but you can see it if you look at the figure up close and in person. I realize there are always going to be paint errors in any kind of assembly line process. It’s just more difficult to deal with when you’re ordering figures sight unseen. The higher price tag also makes it hurt a bit more when things like this do show up. 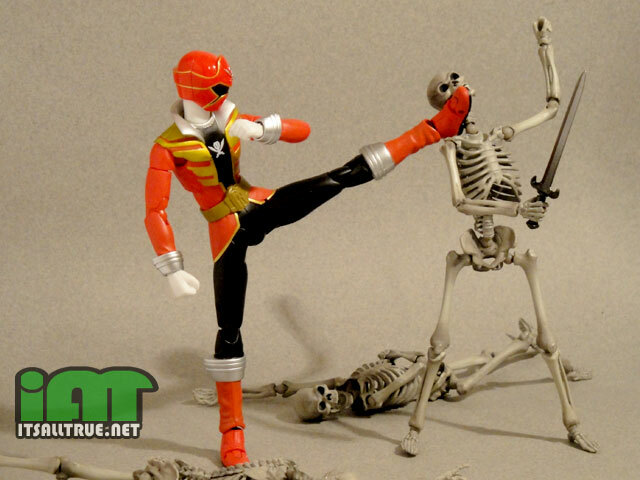 Being a Figuarts figure, Gokai Red’s articulation is pretty amazing. His head, neck, torso, hips, and ankles are all ball joints. His shoulders are swivel/hinges attached to a ball joint. His elbows and knees are double hinged, and there’s also a hinge on his toe joint. His wrists are swivel/hinges, and his biceps and thighs have a swivel joint. All around this figure can do pretty much any pose you’d want. 23 comments to Vault Review: S.H. Nice one. I almost picked this guy up myself. Fun figure. It better not be something stupid like friendship or love. Lol, they haven’t said what it is yet, but you’re probably right. You have to hand it to Bandai of America though. 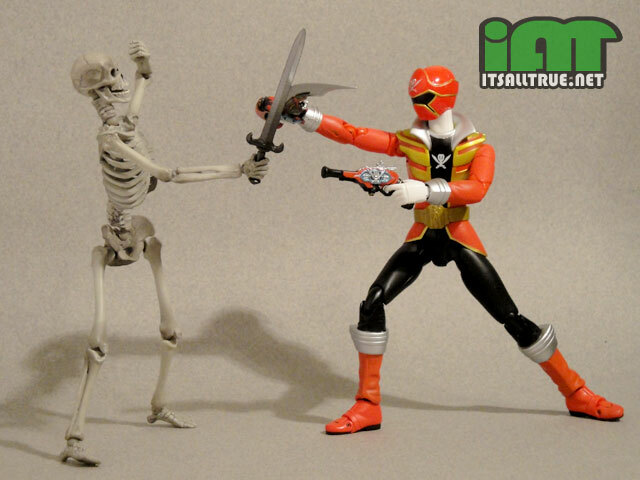 First the excellent ThunderCats toys, then they finally release Rita Repulsa, now they’re importing (unaltered) Shinkenger Red and Gold Figuarts to Toys R Us? They’re really stepping their game up. The painting on the sword and guns are also quite good and surprisingly well done for such small pieces. It’s always interesting seeing what they do for each year’s Super Sentai series. There’s a bag of ‘fallback’ they go to again and again but I think this Pirate motif is one of the more original styles in some time. But it’s funny how it’s so ‘late’ to the party! I know this was somewhat triggered by the insane success of One Piece and, to some extent the Pirates of the Carib. movies (nothing like coattails of a pop culture trend to ride on! That’s Toei! 🙂 ) but really, that’s both kinda old. Maybe it’s time delay from finally getting past the whole limiting Saban/Disney partnership deal. But what I’m really grooving on is, even with that whole ‘ride the Pirate boom’ tip somehow, in some way, and maybe it’s the director and maybe it’s the actor but SOMEBODY throws in some little nods to Captain Harlock here. And of that I approve. It is kind of funny that they jumped on to pirates so late in the game, but it is super fun so who am I to quibble? It’s hard to find these reliably anywhere but facebook. You can try checking some other places, but that’s the best we’ve found so far. It’s kind of funny, were this done by an American company I’d assume it was a ‘hail mary’ to justify breaking out the old toys tooling and get some more ROI by slapping them in new tie-in packaging. Doesn’t seem to be Bandai’s plan. I love some of the incidental music on this show. It’s very fun. They do have specific music but they also use themes from old shows– like when they’re all being Jet-man or something they get the Jet-man theme. man, i am not a power rangers fan (nor sentai) but this looks like a great toy. the wheel piece is a fantastic extra. the keys and the folded arms and all that are again a reminder of how some US companies cheap out on “deluxe figures” where we get less than half that crap for well over half the price. i just dumped 30 bucks on “deluxe” real steel figs that look like yak turds next to this dude. what can i say, i’m a toy fan first, and everything else a distant second… and that is a cool toy. I haven’t watched anything Rangers in years, but it’s good to hear they’re spicing up the stories a bit. I’m a bit shocked that it’s taken Bandai to bring a franchise like this to the Figuarts line, as it seems tailor made given all the other tokusatsu franchises that excellent line carries. As a fellow afficionado of good posing, I must give props for the pose with the ship’s wheel – it’s funny how the most casual or light-hearted of poses can be the most difficult to attain. I’m a bit confused as to why he needs a special “arms-crossed” attachment. I have Wouldn’t a Figuarts figure be able to do that on it’s own, given that they usually have more articulation than 90% of the other toys out there? It’s not the joints, it’s the difference between the human body and plastic. Cross your own arms and feel, see the parts that mush and squish together, as well as the subtle motion of your shoulders, chest, ribs and all that stuff. So you make arms that are ‘squished’ in the right places. Downside, they ONLY look good when crossed. I actually consider the “arms crossed” pose one of the holy grails of figure-posing – it’s just not possible with most figures, even super-articulated ones. Amazingly, I have a 18″ Spider-Man figure that can do it – albeit, he has 60-something joints to do it with. Oh man, I love it when you guys do import reviews because it’s always interesting to hear what american toy fans have to say about japanese toys. I’d love to get Gokai Red, but then I would be compelled to get the rest and I don’t really feel like playing the overly expensive prices for Gokai Yellow and Pink. Though saying that I did just got a DX Mobirate (the phone henshin device) with the keys and man this thing is FULL of sounds and the keys just add so much to it, it’s a good alternative if you like that sort of stuff. I hope we see a review of the Glyos Big Rig from you guys. That thing looks NUTS!